Hey everyone!! I just wanted to drop in real quick and say, "Hey, go meet the rest of the PSA design team!!". :) Check it out here: PSA Stamp Camp! Again, there are some wonderful talanted ladies on the design team!! Hey everyone, hopefully you're all having a great week, so far?!! Well, today I share with you a birthday card I made for my step-father. This month alone, is one of my busiest for birthday's! So, there will probably be a good chunk of birthday cards, popping up on my blog! I have such a hard time doing masculine birthday cards! And for some reason, I don't think it will get any easier for me?! :/ My brain is gonna be on overload because this is only the first, of many more masculine cards to come! Hey ya'll!! Check it out...The new design team (part 1) is up at PSA Stamp Camp!!! You may see someone you know on there....*wink, wink* :) You just have to meet all the wonderful talanted ladies over there!! Have fun taking a look and be sure to stop back friday, for part 2 of the design team!! Thank you, to everyone that left comments! I loved them all and had such a hard time choosing, that I used random.org to pick the winner! Hey ya'll!! Today, I have some BIG news to share with you!! Your looking at one of the new Design Team members for PSA Stamp Camp!!! I am beyond excited and honored to be a part of this design team! =)) There are some very talanted ladies on the team and I hope you join along for all the fun and projects, that will be shared?!! :) WOW! I still can't believe it, this is such a BIG (HUGE) step for me!! Yay!! I also want to 'Thank You' for all the support/comments, you guys give me on my blog!! Without you all around, I wouldn't even be where I'm at! It always make me smile, when I read the comments you leave me...your all too sweet! :) I also enjoy, seeing your blogs and the creations you come up with, your all amazing! So, 'Thank You' again, for everything!! Sorry about the darkness of the photo. Cloudy. With both of my cards I used the Beach House collection and Bazzill's Card Shoppe Cardstock. I kept both of my cards simple. I really wanted to showcase the Beach House collection. Hey everyone, happy Saturday! Hope you're all enjoying the weekend!! 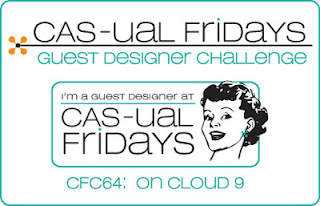 :) I'm playing along with Casual Fridays Challenge again and as always, it's another fun challenge! Hey everyone! I wanted to share with you today, a card a made for a brand new challenge!! 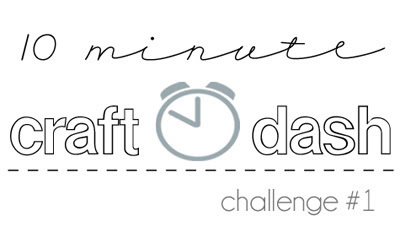 I was going through my blog list and checking out some cards, when I came across 'This' challenge!! This challenge sounded like it was right up my alley! Please excuse my lighting, my weather isn't working in my favor today. Hey everyone, Happy Monday! My Monday is sooooooo quiet! I officially now, have three of my four kids in school! :) This feels great for me. It's been a long time, since I've had it this easy during the day! Now, on to my card. 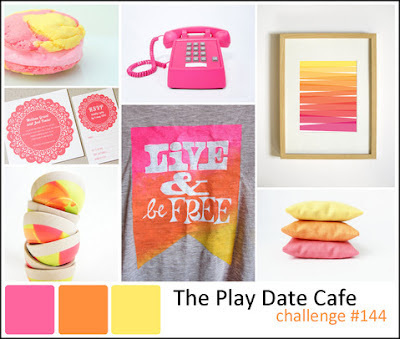 I happened to see the The Play Date Cafe Challenge and decided I would play along!! Which, I must say "You should too!". The colors are so fun and perfect for summertime! I just bought some new ribbons (Amy Tangerine, to be exact) and knew I had to use them! These ribbons make me happy! :) Love them! Okay, back to my card. I kept everything simple and focused on the target colors. For a nice little 'pop', I added clear rhinestones. Thank you for stopping by and enjoy the rest of your weekend!! Bazzill Card Swap (& Giveaway)! Bazzill wants everyone to discover the love of card making - to enjoy making something and giving it away. So Bazzill created Card Swap, a fun activity that invites card makers to register to join (it’s FREE), create 10 of the same card, send them into Bazzill and get their own card and nine others back from people all over the United States. The swap always have a theme and a specific paper to include, but the variety of cards that arrive are unbelievable. People that participate continue joining each swap and new people join in every time. To encourage participation, we have created this kit (offer ends 9/1/12). o 22-sheets of 8x8 Bazzill Spooky & Kooky patterned paper. o 24-sheets of 6x6 Bazzill All Hallows Eve patterned paper. Use the All Hallows Eve paper to make ten cards for Bazzill’s Card Swap. Mail in your creations and get your own card and nine other cards from swappers. For more info and to register to play, visit: http://swaps.bazzillbasics.com/ Offer available through September 1, 2012. Allow 2 to 3 weeks for shipping. Mail to: Card Swap Starter Kit, Bazzill Basics Paper, 7001 W. Erie St., Ste. 2, Chandler, AZ 85226. U.S. addresses only. Thanks for stopping by and enjoy your day!! I wanted a 'soft' feeling to my card. I stamped on my bird and let it dry. I then once again, whipped out my chalks and used a light blue around my bird. For a little extra touch, I added some pearls. Thanks for stopping by today and enjoy your weekend! !